Pears are an excellent canning fruit because they make it through the canning process with more of their color, flavor, ​and texture intact than many other fruits do. There are two basic ways to safely can pears: the hot pack method and the raw pack method. Although it requires fewer steps, the raw pack method results in an inferior product. Raw packed fruit tends to shrink during processing and float up out of the canning liquid. The pieces that float to the top discolor and are unappealing once the jars are opened. The hot pack method reduces the likelihood of fruit float and discoloration. Choose firm, unblemished pears for canning. Its often wondered if pears should be hard when canning. It is best to use ones that are slightly underripe, though not completely hard. The overly ripe fruit is more likely to float in the jars and also has a lower acid content. It is the naturally present acidity of the pears that helps to preserve them, not the canning liquid. Slice off the stems as well as a thin slice from the bottom of each pear. Peel the pears using a vegetable peeler. Cut them in half and use a paring knife to slice out the seeds and cores. Although pears are most often canned in a simple sugar syrup, it is quite safe to can them in juice or even plain water. The canning liquid is a flavoring element, not a safety consideration. If using juice, white grape juice is preferred because of its relatively neutral color and flavor. If using any other juice, such as apple, you may want to dilute it 50-50 with water so that the flavor of the juice does not overpower the flavor of the pears. Bring the syrup, juice, or water to a boil. Add the chunks or slices of pears and simmer them for 2 minutes. 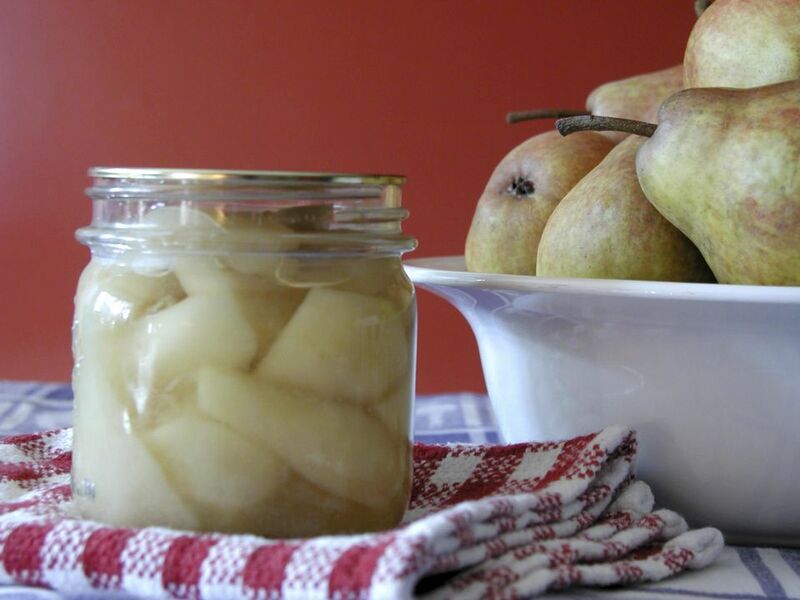 Your canning jars do not need to be sterilized for canning pears, but they do need to be clean and crack or chip-free. They also need to be hot. To do this, fill them with very hot water and then empty them just before filling with fruit. Use a slotted spoon to transfer the pears from the liquid they were simmering in. Fill the jars with the fruit, leaving 3/4-inch headspace between the top of the pears and the rims of the jars. Pack the fruit in quite tightly without smashing it (this is another tip that helps to reduce fruit float). Process in a boiling water bath, 20 minutes for pint jars, 25 minutes for quarts. You will likely need to adjust the canning time for your altitude if necessary. Store them in a canning cellar, your pantry, or give them away as gifts.